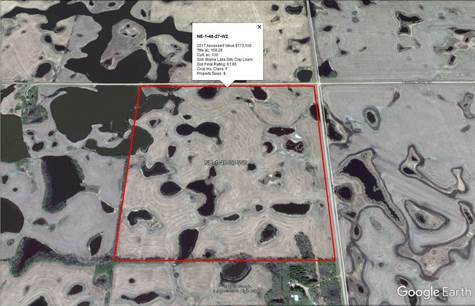 Rare opportunity to purchase parcel of prime farmland within 3 minutes of Prince Albert. Are you looking for a larger parcel to build your dream home on? This property is ideal with multiple potential sites. Power and city water are near by. Scenically located 4.7 kms west of Highway #2 and 48th Street West. Excellent expansion opportunity. Approximately 120 acres are currently being seed with some low spots being flooded in recent years. The farmland is currently rented for 2019 (handshake arrangement). 2)	Mineral Title to NE 1-48-27-W2 is not included in asking price. However, owner will entertain offers to purchase it. No asking price listed.